Connel – the centre of the world. 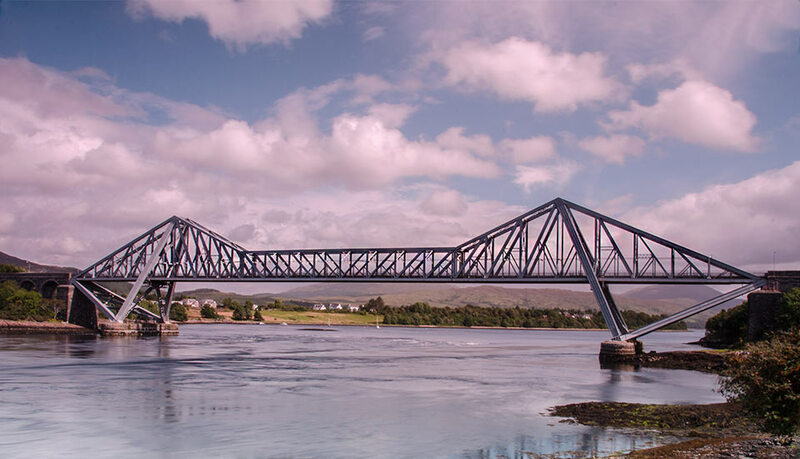 The thing you cannee miss in the village is Connel Bridge, a cantilever bridge that spans Loch Etive at the Falls of Lora. It was built to carry the Callander and Oban railway’s branch line to Ballachulish that opened in 1903. Apart from the bridge, there is a primary school called Achaleven Primary School, and St. Oran’s Church (Church of Scotland). The church is linked with two others. The first is in the nearby village of Dunbeg, the second is on the Isle of Coll. Church services at St Oran’s are held every Sunday at 10.30am. There is a shop and post office in the main village. There are two bus stops, one opposite the post office and the second on the A85, just south of Connel Bridge Junction. Connel is on the main road that runs from Oban and Perth. Connel is just 5 miles to Oban by main road. There is also a minor ‘back road’ to Oban that runs by way of Ardchonnell and Barranrioch, a fab drive on a nice day, if it rains stay on the main drag. A ferry formerly took people and vehicles across the loch to North Connel. When the Callander and Oban railway came to Connel in 1880, a station was opened in the village and named “Connel Ferry”. The station is still open, it being situated on the west highland line to Oban. It is now unstaffed. Oban Airport is nearby on the opposite side of Loch Etive. Connel Bridge has had a strange history. Soon after its’ construction road vehicles were sometimes carried across on a railway wagon. In 1914 it was converted to allow road vehicles to drive over it and for the next 50 years the bridge was used by both road and rail traffic. This stopped with the closure of the Ballachulish branch railway in 1966, and since then the bridge has been used exclusively by road traffic, controlled by traffic lights. The Falls of Lora is a tidal race which forms at the mouth of Loch Etive (under the bridge) when a particularly high tide runs out from the loch. They form white water rapids for two to five days either side of the spring tides, the waters run two ways at once. The falls are generated when the water level in the Firth of Lorn (i.e. the open sea) drops below the level of the water in Loch Etive as the tide goes out. As the seawater in Loch Etive pours out through the narrow mouth of the loch, it passes over a rocky shelf which causes the rapids to form. As the tide rises again there is a period of slack water when the levels are the same on either side. The race is popular with white water kayakers and divers as well as tourists and photographers. 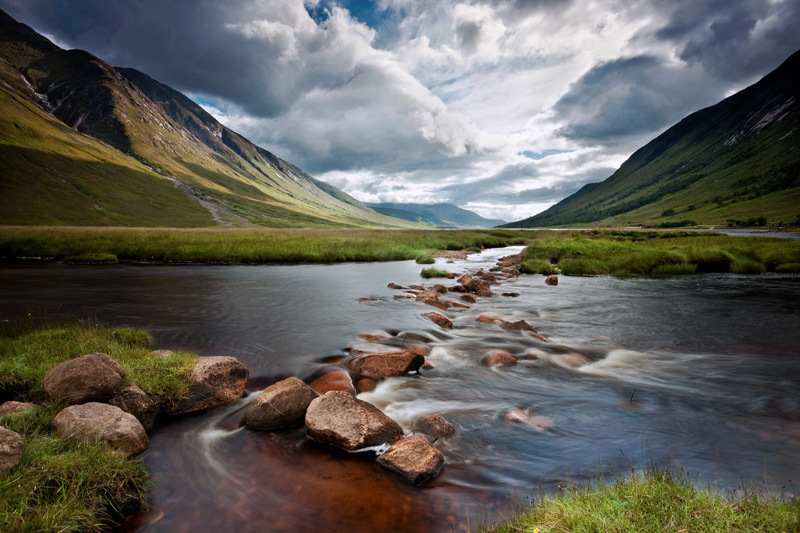 Loch Etive (Scottish Gaelic, Loch Eite) is a sea loch, and measures 19​ and a bit miles long and 3⁄4 mile wide. Its depth varies greatly, up to a maximum of 490 ft. The name Etive is believed to mean “little ugly one” from the Gaelic goddess associated with the loch (it is rumoured my grand-dad wanted to call me Etive!). It heads east for half its length alongside the main road and rail link to Oban, before heading northeast into mountainous terrain. A road along Glen Etive makes the head of the loch accessible from Glencoe, a small colony of around 20 common seals is living in Loch Etive. Just seaward of the mouth of the loch is Dunstaffnage Castle. This was a stronghold of the kingdom of Dál Riata until the 9th century, and possibly its centre (of the world) at one time. It is believed to have held the Stone of Scone before its transfer to Scone Palace. The current ruins date from 1275. Flora MacDonald was prisoned here. In the parish of Ardchattan, on the north shore, is the ruin of St. Modan’s Priory, founded in the 13th century for Cistercian monks. Robert Bruce held parliament within its walls in which the Gaelic language was used. My favourite hang out at home (Connel is where I was hatched) is The Oyster Inn and Glue Pot Bar, have had many an enjoyable drink and meals here, great wee bar with good atmosphere, usually full of locals. 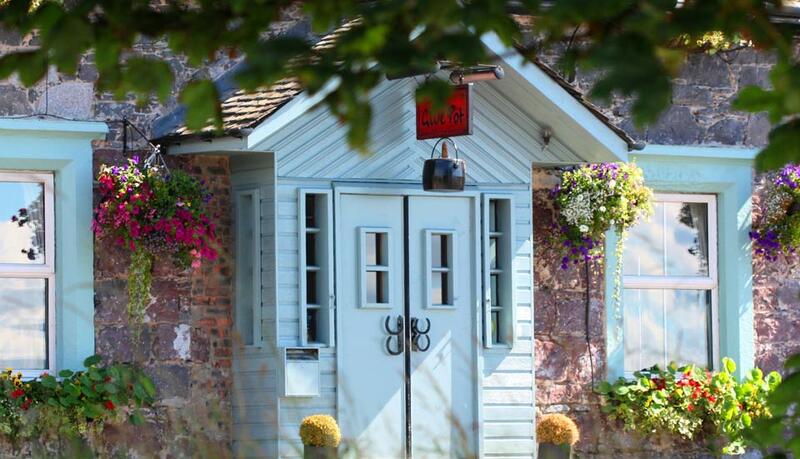 The bar serves traditional pub meals and an excellent choice of ales, wines and single malt whiskies, is an 18th Century pub, licensing laws in Scotland banned drinking in public houses on Sunday’s. Under the Act canny locals became infamous “bona fide travellers” who could be served in an inn or hotel. Travelling in good faith meant that you should not be “travelling for the purpose of taking refreshment”but you could be “one who goes into an inn for a refreshment in the course of a journey, whether on business or pleasure”. The locals took the morning conveyance from Oban to the Glue Pot at Connel Ferry. They were then ‘stuck’ until the next conveyance in the late afternoon returned to take them home. Behind the inn was a blacksmiths where old horse hooves were melted down to make glue. Some old glue pots hang from the ceiling in the bar. A local tradition… On the way in and out of the Glue Pot, touch the Glue Pot hanging over the door…it brings you luck! Take it from me (Paul McLean) this is a grand hang oot. Am I biased at all? Not really, it just happens to be the best place in the world, where I was born a few years back.